Special Containment Procedures: SCP-1048 is currently free to roam Site 24, as it poses no threat and has been observed to greatly improve the morale of personnel that interact with it. The whereabouts of SCP-1048 are currently unknown, though it is still believed to be somewhere in Site 24. Subject is to be secured for containment, but any creation of SCP-1048's should be destroyed on sight, unless further evidence warrants less extreme actions. No teddy bears are to be allowed in Site 24 to prevent any confusion or mistaken identity. Any object that resembles a teddy bear is to be reported to the security team immediately. 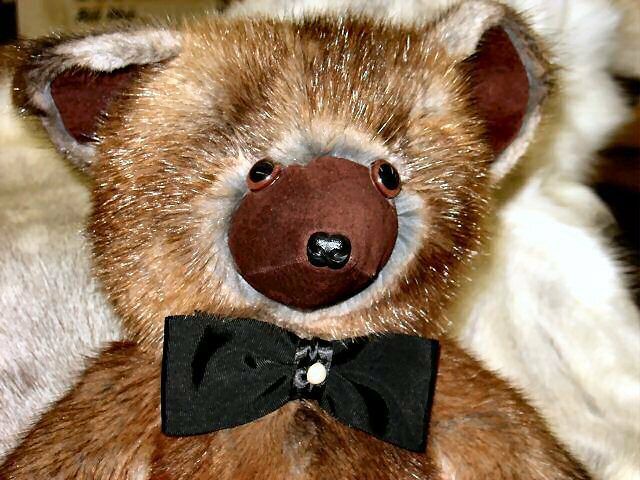 Description: SCP-1048 is a small teddy bear, approximately 33 cm in height. Through testing, composition of the subject revealed no unusual qualities that make it discernible from a non-sapient teddy bear. Subject is capable of moving of its own accord, and can communicate through a small range of gestures. The subject regularly shows affection to individuals in ways found endearing by most people. Affection is usually given in the form of a hug to the lower leg, but subject has also been observed dancing, jumping in place, and in two separate events it has even drawn child-like pictures for janitorial staff. All Foundation personnel that have interacted with the subject have responded positively to its affection, even D-class with normally sociopathic tendencies. Attempts at direct communication with SCP-1048 have not been considered successful. Though it is capable of simple gestures to indicate a "yes" or "no" answer, it will often not react to lines of questioning concerning its nature or where it originated from. It is not known if this is because SCP-1048 simply does not know the answers, or because it does not want to answer. Though capable of drawing pictures, it has not used its art as a form of communication beyond showing affection, even when encouraged to do so. The more anomalous behavior of SCP-1048 was not observed until approximately 7 months after it was originally secured. It is hypothesized that the subject is able to construct crude replicas of itself using various materials, by a process that has yet to be observed directly by Foundation staff. Dr. Carver has suggested that SCP-1048 uses its endearing qualities to lull those around it in to a false sense of security, allowing it to collect materials to produce these creations. Currently, there are 3 known creations of SCP-1048, designated SCP-1048-A, SCP-1048-B, and SCP-1048-C. The nature of these creations has been in stark contrast to SCP-1048's general behavior, as all have exhibited extreme violence towards humans. SCP-1048-A: On ██/██/████, SCP-1048-A was discovered wandering Site 24, accompanied by SCP-1048. Subject resembles a teddy bear similar in size and shape to SCP-1048, but is made entirely out of human ears. Witnesses interviewed reported that it appeared SCP-1048 was giving a "tour" of Site 24 to SCP-1048-A. Dr. Carver was called to the scene, along with a security team. The security team arrived first, and attempted to contain SCP-1048-A. Subject emitted a high-pitched shriek that inflicted intense pain in the eyes and ears of everyone in a 10 meter radius. Ear-like growths immediately began growing on those within 5 meters of the subject, covering their bodies in less than 20 seconds. Every person afflicted with this symptom died within 3 minutes, resulting in the death of ██ personnel, including the entire security team. Autopsies revealed the cause of death to be asphyxiation caused by an abundance of the ear-like growths manifesting in the mouths and tracheae of all victims. SCP-1048 and SCP-1048-A fled the scene before Dr. Carver arrived, and have not been contained since the incident, though sightings of both have been reported on multiple occasions. Shortly after this incident occurred, a researcher was discovered missing an ear. According to him, it was removed through unknown means while he was sleeping. No other victims of ear removal were found, so it is unclear if SCP-1048 obtained more ears from another source, or if it is capable of duplicating objects or materials. SCP-1048-B: Subject was discovered by several Foundation staff members in the cafeteria of Site 24 on ██/██/████. Subject's appearance was nearly identical to SCP-1048, but it moved in an irregular, jerky manner. Witnesses reported that it appeared as if something was moving inside of SCP-1048-B. Subject made no attempt to interact initially, until a burst in its seams revealed what appeared to be the hand and arm of a human infant poking out and grasping at the air. At the sight of this, a female researcher named ████ ██████ screamed, and SCP-1048-B reacted by emitting a high-pitched cry similar to that of a human infant. The subject then attempted to [DATA EXPUNGED] the screaming researcher, causing massive internal damage. In the ensuing chaos, a security team was forced to [REDACTED] both the researcher and SCP-1048-B. Approximately 3 hours after this incident, Dr. ██████ was found unconscious and bleeding in her office. An abortion had been performed on her while she was sleeping, and the 8-month-old fetus was never found. It is hypothesized that SCP-1048 used Dr. ██████'s unborn child to create SCP-1048-B. Information regarding the possible origin of SCP-1048-B is not to be leaked to the survivors currently undergoing therapy for the incident with SCP-1048-B, as Dr. Carver believes it would be extremely detrimental to their recovery. SCP-1048-C: Subject resembles a teddy bear similar to SCP-1048, but composed entirely of rusted metal scraps. Subject was first sighted on ██/██/████ by Dr. Carver in his office while writing up a report on the SCP-1048-B incident. Subject fled the room when it noticed Dr. Carver observing it. In the attempted pursuit of SCP-1048-C, Dr. Carver witnessed the death and maiming of █ Foundation personnel as the subject exhibited extreme violence during its escape. SCP-1048-C has not been encountered since this initial sighting, and it is unknown whether it still resides somewhere within Site 24. The origins of any materials possibly used to construct SCP-1048-C by SCP-1048 are also unknown at this time. Addendum 1048-1: SCP-2295 is similar, but nearly antithetical in function, to SCP-1048. Attempts to establish a common origin are ongoing. Extreme caution is to be taken if SCP-1048-A or SCP-1048-C are encountered again.